"I don't know why you are asking me about this"
"Without Davis Love III, Fred Couples, Jay Haas and other U.S. mainstays from the pre-Tiger era, Woods and Mickelson seemed far more comfortable"
1. Rory Sabbatini. On a team of disappointments, he stood out with a homely 0-3-1 record, including a loss in the leadoff single match, which is supposed to set the tone for the team. 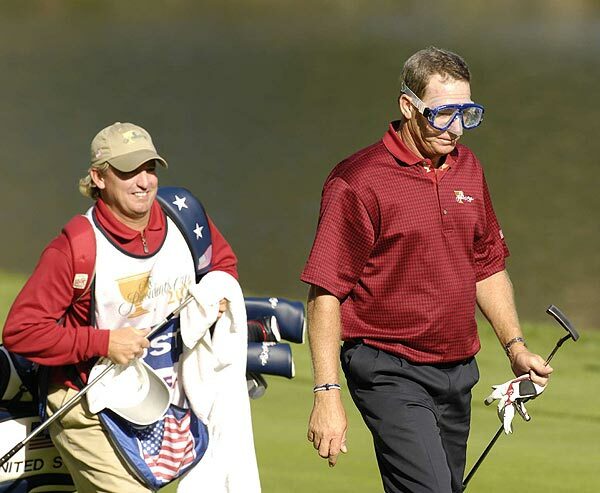 Not only that, but Woody Austin has now usurped him as golf's biggest dufus, an honor Sabbo seemed to treasure. 3. George O'Grady. The Euro tour's executive director used a Presidents Cup press conference to pooh-pooh drug-testing as unnecessary and too expensive. Earth to George: ask Bud Selig how costly denial can be. 5. Vincent Chase. He used to be the most famous Aquaman, but now Woody Austin has stolen this title, too. Funny thing about Austin, as goofy as he is, you can't deny he's got a ton of game. "The Ryder Cup has been captains coming up and saying, ‘You’re playing with him and he’s playing with him.'" What the Presidents Cup inspired Azinger to do was call Nicklaus — and that’s never a bad idea no matter what the subject, unless it’s the golf ball — along with Tiger Woods, Phil Mickelson, Jim Furyk, David Toms and Stewart Cink. Low blow Doug! Low blow. 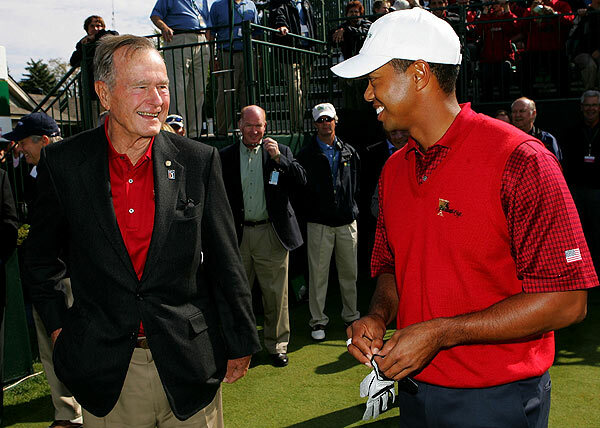 Those five have played on each of the last two Presidents Cup and Ryder Cup teams. Nicklaus wants it to be fun, but isn’t it always fun when you’re winning? Captain Jack also has reduced the science of pairings to an art form by letting the players decide. He pulled his master list out of his pocket Saturday morning, and next to each player was three or four names. Nicklaus couldn’t accommodate everyone, but he was close. The International players sometimes wondered if they were really playing a home game in the past four days at Royal Montreal, near the US border. The galleries cheered for Americans Tiger Woods and Phil Mickelson sometimes with greater fervour than the Internationals. If the competition returns to somewhere close to the US, watch out for a mutiny. "I think South Africa and Australia would be the best place," said International Vijay Singh. The US Tour selected Canada for this year's event because of its proximity to the US, making it an easy trip for the American players, and the time zone suited US television. But Scott and his teammates want the Americans on the other side of the world, where the heat, flies, jetlag and all of those other intangibles will come into play. The Internationals started yesterday's singles needing to win 10 of 12 matches to pull off an unlikely victory. They did win seven matches, but the US prevailed 19½ to 14½ overall. The four Australians were generally disappointing. Geoff Ogilvy and Stuart Appleby finished with two wins and three losses, while Adam Scott had one win, three losses and one tie. Nick O'Hern posted one win and four defeats. Weir Wins! Salt Lake City Ticker Tape Parade Next? I tell you, the President's Cup tension was just too much for me to take. Especially since it was clear and 78 with 2 mph winds out of the east and the forecasted gusts to 3 mph never materializing here in the community recognized around the world as the home of the homeless. But from what I saw fast forwarding on TiVo, the Villages ads were almost as spontaneous as the NBC announce team's surprise when Woody Austin pulled out the snorkeling gear on 14. Amazing how the cameraman knew to stay on him! And the guys in the replay truck were ready with the clip of Woody's lake dive! Those guys are good! PGATour.com's Melanie Hauser says Weir's win makes him a "national hero" and that fans got to see "the moment of a lifetime." In the same piece, Gary Player is quoted stating that this win might turn Weir's life around. Like it was so bad before! SI's Michael Bamberger writes that Rory Sabbatini and Woody Austin became team players this week. Hopefully they'll go back to being themselves next week. Gary Van Sickle looks at Austin's quickly expanding infamy. Golf World's Jim Moriarty offers a few behind the scenes observations while Ron Sirak tries to understand why the American's can win the President's Cup but not the Ryder Cup. 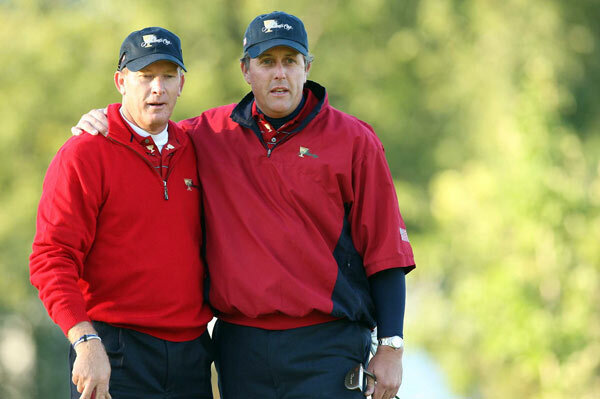 The circumstances that built the intensity of the Ryder Cup were real. It is a feeling that cannot be manufactured. Though it goes pretty much unacknowledged by both sides, the U.S. teams goes into the Ryder Cup knowing how Europe feels. That builds the intensity of the event. What Europe does well is embrace that intensity while the Americans -- burdened by their better resumes -- feel the pressure of being the team that is supposed to win but just can't seem to get the job done. 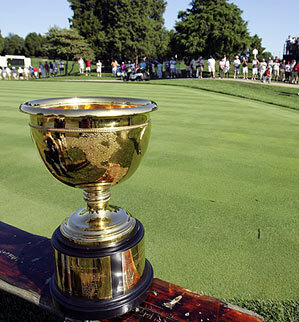 The Presidents Cup was created in 1994 because of the power shift in the game to the Pacific Rim. Greg Norman, Ernie Els, Jumbo Ozaki, Steve Elkington and others were just too good to be left out of such compelling team competitions. Well...now...there were some financial considerations, too. Charitable ones of course. Since, after all, the matches are pretty much done. Sheesh, Jimmy Roberts tried to get golf's version of Norman Vincent Peale to offer encouraging words, and even the sunny Gary Player couldn't muster up much with a camera in his face or in a post round chat with the assembled inkslingers. "It's not over," International captain Gary Player said. "But things don't look too good. The egg is not sunny-side up." Meanwhile, if you are touched by the historic insignificance of the Weir-Tiger singles pairing, you can read all about how it came to fruition. Here are the other pairings. "Captain Jack is already calling him Jacques." Golf World's Jim Moriarty says Woody Austin better learn to deal with YouTube fame and teammate ribbing after his day two Presidents Cup dive (still not posted on YouTube, a full 8 hours after). And, of course, what can you say about Woody Austin, having set the world butterfly record in the lake on the 14th hole and then birdieing three of the last four holes to gain a halve? Maybe they should add the dunking stool to the team room. The Christmas list is no doubt already being compiled on the U.S. team bus for their Rookie of the Year. Flippers and mask. Wet suit. Spear gun. Styrofoam noodles. Life vest. 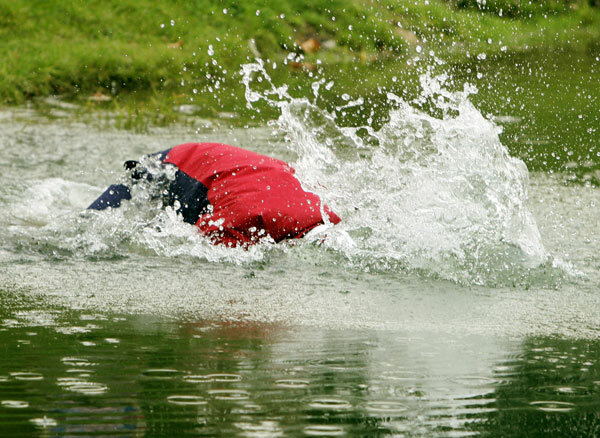 A professional will often try a risky play from a hazard but rarely do they wind up fully submerged. Captain Jack is already calling him Jacques. At least Woody will never again have to look at the video clip of him beating himself over the head with his putter at Hilton Head. They've got something much, much better now. "Put the two together," said his playing partner David Toms, "and you'd be, 'What's this guy all about?' But, I'll tell you what, he's a heckuva golfer." Meanwhile, at least golf.com has the sequence from Getty Images' Timothy Clary, including the shot seen above. Five-time British Open champion Peter Thomson, captain of that International team who famously introduced the American team at opening ceremonies as “the greatest collection of golfers in the world,” said he was not interested in returning as captain. “I’m a has-been and I’m happy to be that, instead of a could-have-been,” Thomson said. But he said he would favor Greg Norman leading the International team, especially with the matches being held in Australia. Norman, perhaps the most popular golfer to emerge from Down Under, played on that ‘98 and lost a singles match against Tiger Woods. Norman and Finchem have been at odds for much of the last decade, however, and it was not clear if he would be interested. Despite a leaderboard covered with American red numbers, perhaps the most poignant moment of a gray afternoon was Nicklaus instructing Phil Mickelson and Woody Austin to concede a 3½-foot par putt on the 18th hole that assured Mike Weir of Canada and his International team its only point of the opening session. In a tense battle with only six holes halved, the match was all square going to the 18th when both sides missed the green. Mickelson blasted out to 12 feet, while Weir chipped to 3½ feet above the hole. Austin made the par putt, and before Vijay Singh spot his ball, the match was conceded. “Captain Nicklaus was right. It was the right thing to do,” Mickelson said. And he followed up, saying, "If it was anyone other than Vijay, I would have thought to do the same thing myself." 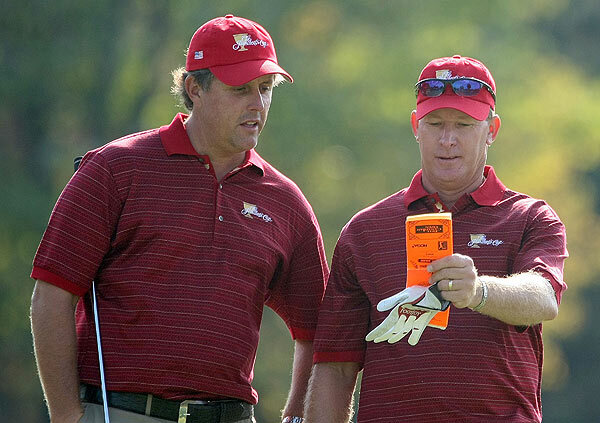 Steve Elling breaks down the conceded putt and Nicklaus's reasoning. (Warning for those who should not be rolling their eyes: it was for Canada and Mike Weir). MONTREAL, Quebec, Canada – Just prior to the start of the seventh Presidents Cup this afternoon at Royal Montreal Golf Club in Canada, PGA TOUR Commissioner Tim Finchem announced that another “Royal” venue – Royal Melbourne Golf Club in Australia – has been named host site of the event in 2011. Royal Melbourne Golf Club becomes the first golf course outside of the United States to host the prestigious match-play competition more than once, as the 1998 event was also held there. In April, the PGA TOUR announced that the ninth staging of The Presidents Cup, which is slated forNov. 14-20, 2011, would be held in Melbourne, Victoria, Australia, but a host course was not named until today. The Royal Melbourne Golf Club, which has existed continuously since 1891,is one of the most highly regarded golf clubs in Australia. You don't say! Who knew?! Charity Is At The Heart Of The PGA Tour: Presidents Cup Opening Ceremony Not Televised! It's hard to imagine the Golf Channel could pass up on Wednesday's festivities at Royal Montreal in favor of Playing Lessons with Arron Oberholser, but alas, you don't have to set your TiVo's for the big event where Vegas oddsmakers have posted 5-1 odds on a Kenny G cameo, 3-1 on a Celine Dion ear-piercing medley of O Canada and My Heart Will Go On, and 2-1 odds on either one headlining Sunday's Closing Ceremony/site evacuation session. This isn’t to say that even officials of major golf organizations will be welcome everywhere. Prime Minister Stephen Harper will be host of a private dinner on Tuesday for the teams, their captains, Jack Nicklaus and Gary Player, and visiting dignitaries, including PGA Tour commissioner Tim Finchem. Quebec Premier Jean Charest will attend the event. Wednesday’s entertainment will be rather splashier. The lavish opening ceremony will take place at the Royal Montreal at 4 p.m. The event’s opening gala will occur that evening in the ballroom at the Fairmont Queen Elizabeth Hotel in Montreal. Harper and Charest will be on the stage during the opening ceremony, as will Montreal Mayor Gerald Tremblay and former U.S. president George Bush. Ward & Ames, a Houston-based company, has choreographed the opening ceremony for the six previous Presidents Cup tournaments and will do so again. Area boys and girls choirs will sing the U.S. and Canadian anthems. The national anthems of every country with a player will also be played. That evening, at the gala, called Celebration of Nations, food stations representing the cuisine of the various countries will be set up. This means stations representing the United States, Canada, South Africa, Fiji, Australia, Argentina and South Korea. "I think it will be great if Mike Weir played Tiger this time. I think that would be a great match." Shockingly, I did not pour through the Tuesday transcripts from Royal Montreal, but it's become apparent what the scribblers will be focusing on in Wednesday's editions. For a sample, check out The Golf Channel's Ian Hutchinson writing about the potential "dream match" between Tiger Woods and Mike Weir. It’s a concept that American captain Jack Nicklaus finds intriguing, but needs the cooperation of his International counterpart Gary Player and Weir himself to pull it off. “I think Gary and I will have to talk about it. I think it will be great if Mike Weir played Tiger this time. I think that would be a great match. I think it’s the logical thing to try to do, but Mike might not want to play him,” said Nicklaus. The idea definitely does have its appeal from an entertainment point of view, something both Nicklaus and Player deem important. With 28,000 paid customers per day expected at Royal Montreal, the buzz would be electric, but attention on that one match could be overwhelming. I don't know about you, but the dream match is Tiger Woods vs. Rory Sabbatini. Oh, and playing right in front of Phil Mickelson vs. Vijay Singh. "Golf is the most democratic of games. It should have no national boundaries and nor should it be used as collateral for anti-American, Canadian, European or Argentinian sentiments but that is what those who are new to golf want." The Principal is mad as hell about all of this exploitation of nationalism at "cup" events and he pens an interesting take on the state of team events. The President’s Cup is the biggest golfing event ever to be staged in Canada and while the wonderful Canadian Open struggles with scheduling and audience issues, the rah-rah men and politicians will be using this flag waving fest as an opportunity to make snide remarks while increasing political profiles. Is this what golf has become in the 21st century? A season of three majors, the USPGA and repetitive annual team events that create the opportunity for dummies to shout and scream that your country (or in the case of really sad dummies, your continent) is the best in the world! Golf is the most democratic of games. It should have no national boundaries and nor should it be used as collateral for anti-American, Canadian, European or Argentinian sentiments but that is what those who are new to golf want. These team games are meant to foster good relations but instead are often hi-jacked by those competing or watching as an opportunity to teach someone a lesson. Has it become so ugly that representing your country or continent or part of the world is more important than what the founders of our great game envisaged? The chance to test oneself and your inner demons, the opportunity to meet new friends and enjoy a beer or two, the gift of travelling the world and meeting other tortured souls who share your love of the game or simply enjoying a few holes on your own on piece of windswept linksland! You can just sense the underwhelmed enthusiam in the various Presidents Cup preview pieces. Lorne Rubenstein offers the Canadian perspective while Doug Ferguson previews the Cup by considering its recent history. "The one problem I could see is if Tiger or Mickelson decided not to play," Rubenstein said. "They'll play as long as Nicklaus is captain because they're not going to snub Nicklaus. But if there's a new captain and Tiger decides not to play, then I think the Presidents Cup would have a real problem." Gary Van Sickle says "few serious international golf competitions have received less buildup than this week's Presidents Cup, to be played in Montreal," then rants about the FedEx Cup ad saturation. 1. Tiger Woods vs. Rory Sabbatini: The mouth of the south against the king of the hill. If the Captain's have any heart at all, they will give us the pleasure of watching these lovebirds in singles play. John Huggan is so excited about the President's Cup, he actually wrote about it and loves the International selection of Mike Weir, a Canadian who loves his country so much he lives in the predominantly Mormon province of...Utah. "Mike, as we know, won the Masters and has been a very, very good player throughout the years, a very, very good match player," babbled Player, who clearly had no idea that he was talking about a man who, four up on the 15th tee, lost the last four holes to Australian Geoff Ogilvy in last year's World Match Play Championship at La Costa. "Mike is a terrific competitor, a real fighter." Yet again, that assessment has little basis in reality and more to do with the diminutive Weir's lack of inches because, as we all know, every little guy (see Player himself) just has to be a "battler," especially in head-to-head match play. Then again, maybe not. The Canadian, it should be noted, has only once made it through more than one round in the aforementioned WGC Match Play, a record that hardly commends him as a "fighter" or a man to fear when holes, not strokes, really count. Plus, the numbers don't lie. This year the former Masters champion has but two top-ten finishes in 19 PGA Tour starts, lies 84th on the money list and his statistics are off the charts. Convinced that his 2005 selection of No. 22 points man Trevor Immelman vaulted the family friend rising star to even greater success, International team captain Gary Player expects to boost gate receipts resurrect the career of Mike Weir by adding him to the President's Cup team. Mike, as we know, won the Masters, and has been a very, very good player throughout the years, very, very good match player. Even though he didn't finish in the Top-10, you know, it's a different story when you're playing match play and medal. And Mike is a real -- he's a terrific competitor. He's really a fighter, and I've got tremendous confidence in him. He's a wonderful -- you couldn't ask to have a better team member than Mike. If you don't put him in, he doesn't sulk. If you put him in, he always says he's willing to play anybody. As a captain, you know, it's always a difficult position because you can't satisfy everybody, even though you're trying your best. But he is a terrific team member. And being played in Canada, if we didn't have a Canadian in the team in my team and playing in Canada, I can assure you in my opinion only, the series would be quite flat amongst the Canadian people. Mike is a hero in his country, deservedly so. And I'm sure the Canadian people are going to be relieved, because I continuously had questions every week: "Are you putting Mike, are you putting him in?" And I said, we have to wait till the end obviously. Jack Nicklaus rounded out the American squad with Lucas Glover and Hunter Mahan. I'd make a joke, but the state of American golf just isn't very funny anymore.